Stay connected to the latest news about Challenge and Conquest by signing up for the monthly newsletter that we send out to parents, leaders and friends. 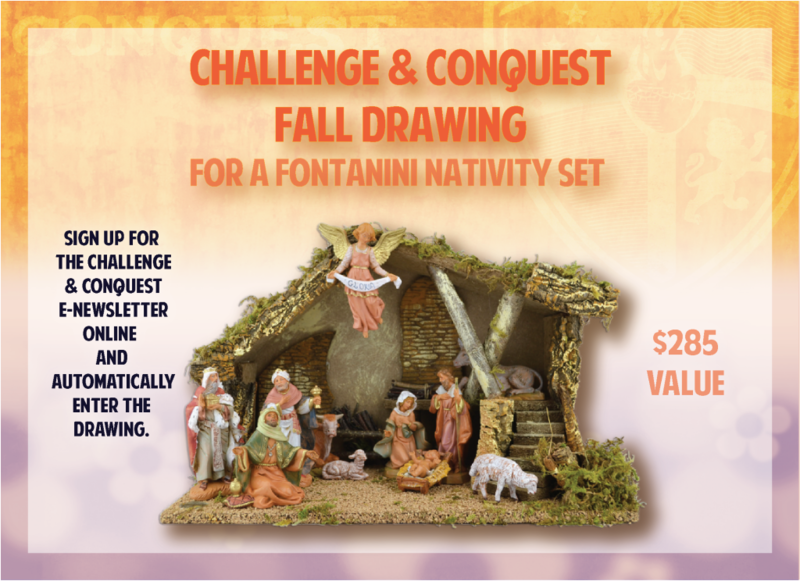 By signing up you will automatically be entered into the Fall Drawing for a Fontanini Nativity Set. You can subscribe by clicking the subscribe button at the bottom of the website or on the top of the NEWS section page. The drawing will be on Nov. 1st, 2015 and the nativity set will be shipped to the winner, at no charge. This Fontanini nativity set is made in Italy and is made of durable polymer (kid friendly and long lasting.) This set includes the wood & moss table and eleven figures that are 5” tall: Jesus, Mary, Joseph, the 3 Wise Men, an angel and the animals. BONUS: If you are an adult leader or team leader and submit a story to the Challenge or Conquest website, we will automatically enter you twice in the drawing!